This beautifully presented second floor apartment in Edinburgh’s Old Town is perfectly situated in the heart of the city to explore all that Edinburgh has to offer. 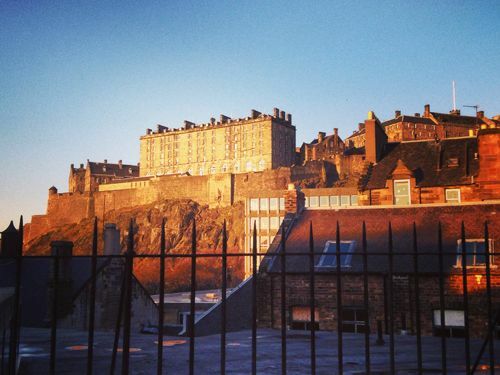 There is a communal roof area with views of Edinburgh Castle - perfect for watching the Edinburgh International Festival and Hogmanay fireworks, or for having a peaceful drink at sunset. (Please note this is not a terrace, but simply a flat roof with a fence around it. There is a foldable table and chairs in the apartment that you can use if you want to sit on the roof). Bread Street is a fantastic location in the heart of the UK’s favourite city (Observer Travel Awards 2012). The best of Edinburgh is on your doorstep. World-class tourist attractions, cutting-edge theatres and vibrant festival venues can be found amidst a throng of Michelin-starred restaurants, artisan cafes and leafy parks just beyond your threshold. You'll find guide books, brochures and leaflets in the apartment to help you figure out what your "can't-miss" Edinburgh adventures are. This completely modernised apartment benefits from classic Edinburgh high ceilings and large south-facing windows, as well as a brand new kitchen and shower room. Comfort and convenience are high on the agenda, with luxurious Egyptian cotton bedlinen, a well-equipped kitchen, an iPod/smart phone dock and Wi-Fi throughout. Check-in is from 3pm on the day of arrival and check-out by 10:30am on the morning of departure. Whenever possible, we are happy to arrange an early baggage drop-off or late baggage collection to suit your travel plans. We provide a friendly and personal service, meeting all guests on arrival to provide keys and show you around the apartment. Our hope is that the apartment will be a home away from home during your stay in Edinburgh. If you have any questions, please do not hesitate to get in touch with us. We would love to hear from you! Call us biased, but we think this is the PERFECT location to explore Edinburgh (if in doubt, have a look at the list of what's available within 10 minutes' walking distance!). We love the view from the roof and the character of the flat, with its high ceilings, bay windows and even an old-fashioned clothes pulley. The layout is also really great and works well for three or four guests, since all rooms are accessed from the hallway, so there's no walking through each other's rooms to get to the bathroom or kitchen. The shower room has been decorated with premium quality floor and wall tiles. We have a portable air conditioning unit that we install for use in the summer months. The living room has a very comfortable 3-seater sofa bed which sleeps two It’s a UK double bed size. Please see our images for a bed size guide. You will always find some basics to get you started, including tea, coffee, milk, sugar and some spices. There are pots, pans, dishes and utensils to prepare a meal for up to four people. 32' Samsung flatscreen with a wide selection of Freeview channels. Bluetooth enabled speaker to connect your phone or other bluetooth enabled device to. It also has a mini headphone jack cable as a connection option. A small selection of guide books is available for browsing. Playing cards, Uno, Jenga, Scrabble and multi game pack. Communal roof area. Please note that while the view from here is very good it is a bare roof top area, so we provide a foldable table and chairs for you to take out. The apartment is on the 2nd floor and has no elevator. This is a city centre apartment and as such parking options are either pay or display or a parking garage a short walk from the apartment. You can also park for free on street in an area just outside of the charged parking area. This is a lovely 20min walk away along a canal. We were greeted by Linda and she showed us around the apartment. It had everything we needed and was very cozy. The location was great. Within easy walking distance of Grassmarket, Edinburgh Castle, Princes Street and Arthur's Seat. It was the perfect way to start our honeymoon. We would certainly stay here again! Yay for a great start to your honeymoon! We hope the rest of it is just as good. Thank you so much for the review! Thanks Louise for the 5-star review! We're so pleased that you found the flat comfortable and charming. Best place, location and flat in Edinburgh! We loved our time in Edinburgh and this flat was a lot of the reason why. It’s perfectly located and well appointed. Fantastic! Bed super comfy!! Communication with Emelie was great and once we arrived at the apartment Linda kindly showed us around the apartment. There were some breakfast items to get us started which were much appreciated! We had a fantastic stay and we know where we'll be staying if we return. A cafe a few doors down called Lovecrumbs do amazing cakes! Thanks again. Nicola & Tom. Thank you Nicola and Tom for the wonderful review! We're so happy that you enjoyed your stay and we'd love to have you back in the future. Eating & Drinking: If you’re looking for a local café, Lovecrumbs is only a couple of doors away, and Starbucks, Costa and Caffe Nero are just around the corner.